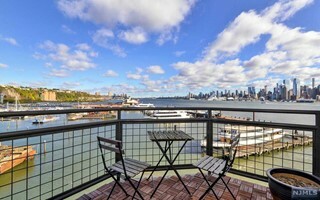 Riva Pointe consists of a beautifully landscaped promenade on a pier jutting out into the Hudson River opposite midtown Manhattan. 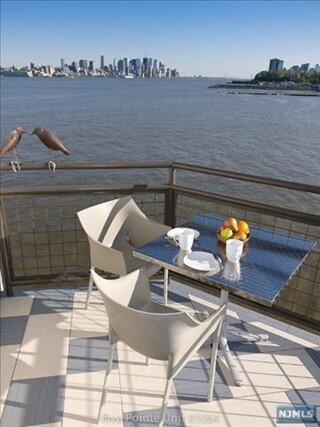 Riva Pointe offers all residents the most beautiful views of NYC from every unit - some facing all the way down to the Verranzano Bridge and the Statue of Liberty - while others face north to the midtown NYC skyline. It was built in three separate phases consisting of 237 townhouse style residences beginning in 1990 for Phases 1 & 2, and ending in 2007 with the completion of Phase 3. 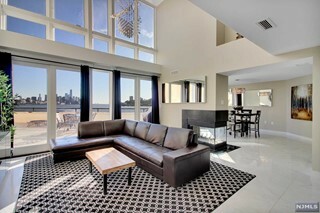 The last phase is built on a pier right above The Hudson offering direct views of New York City from all sides. The is a brick walkway/courtyard with benches that is centered between the north and south facing residences. Elevators in various spots bring residents close to their own residences. The feeling is of being on an ocean liner. When entering and of the resident homes in this gated community one feels they are on a ship at sea. The water is all around them and with the boats going up and down the Hudson River making it really feels like you are on a vacation at sea. 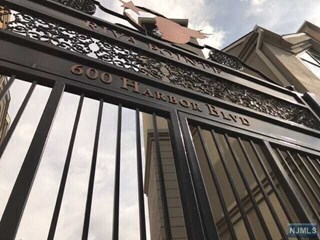 The private gated community of Riva Pointe is very secluded; yet it is so close to the Lincoln Tunnel and just adjacent to the Weehawken Ferry to NYC. 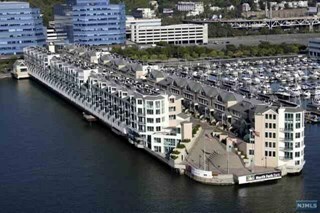 Across the street are the shops and Lincoln Harbor Mall that include Ruth's Chris Steak House, Houlihan's Restaurant and the world famous Chart House, just up the street. Additionally, just adjacent to the complex is the beautiful Lincoln Harbor Yacht & Marina Club, featuring world class yachting. dinner cruices, and boat rentals of all kinds. If you are a boating enthusiast this is the place to be. Riva Pointe consists of 1 bedroom/1.5 bath residences with approximately 873 square feet of very modern space; 2 bedroom/2.5 bath duplex residences from 1,345-1,421 square feet; and 3 bedrooms/3.5 bath duplex residences of approximately 1,541 square feet. All Riva Pointe residences have sensational views of either NYC looking north from midtown or the city looking south from midtown. Most have fireplaces. All have terraces. 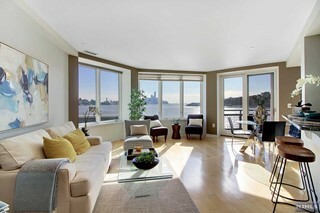 Since the complex is on a pier extending out into the Hudson River each unit has the feel of floating on a ship at sea. 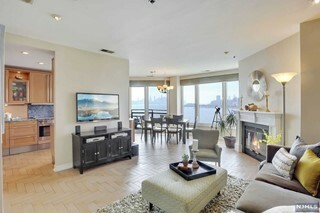 The promenade area leading to all units is beautifully landscaped and has a quiet neighborhood feel to it. Riva Pointe has the closest access to the Lincoln Tunnel, and to the entrance to I-95 North and South, of any waterfront complex. 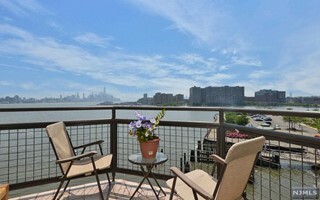 It is also adjacent to the Weehawken Ferry which whisks riders to NYC in just a few minutes. Bus service to NYC Port Authority is only a few minute ride by either the 156, 158, 159 NJ Transit Buses and the Hudson-Bergen Light Rail is about 1 mile north of the complex. 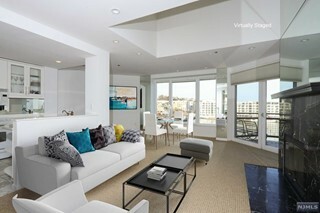 Riva Pointe amenities include a 24 hour concierge and security, covered parking, a state of the art fitness center with an indoor lap pool and sauna, wood-burning fireplaces, European kitchens and baths and private balconies with spectacular views. There is an on-site grocery store and The Sheraton Hotel is next door. Additionally, there are private bike storage rooms and private storage areas.